New York City consistently upholds its trendsetter reputation but what’s unique to its contributions lies in its inherent diversity. There are so many great cocktail bars with different styles, atmospheres and programmes, so narrowing down this list to just 10 was quite a challenge. The overall shift is a more democratic and inclusive approach to drinking in New York. 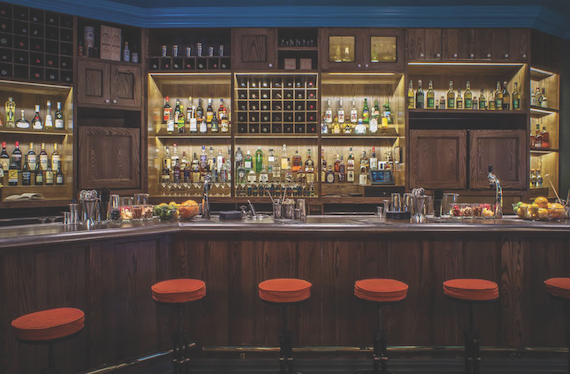 The best parts of the ultra-refined mixology bars are trickling down to regular bars and restaurants without any of the perceived stuffiness – in fact, a decent drinks programme is a prerequisite to being taken seriously and staying competitive. And vice-versa, bars are taking cues from restaurants to offer enticing bites. Bars are much more focused on comfortable hospitality but the places that do it best don’t compromise on the drinks. Neighborhood bars and restaurants are taking small steps to better drinks – you don’t have to go to a temple of mixology to get a decent Manhattan. “I can’t tell you how happy it makes me to be able to order a pitch-perfect Negroni before dinner,” says Pouring Ribbons’ Joaquín Simó. Another key factor in delivering top-notch hospitality lies with the staff – and there’s never been so much talent in this city. The fact that bartending is viewed as a legitimate profession means staff are more invested and dedicated, resulting in better business and, ultimately, a better experience for the customer. That’s something we can all drink to. Here’s where you should do so in New York. Pouring Ribbons is not a speakeasy – it’s a local bar that offers delicious drinks and warm hospitality. Ingredients are of the utmost importance but it’s the guest’s experience that’s put on a pedestal, and we – as New Yorkers and an industry – are all the better for it. The ‘drink matrix’ maps the 15 house and 15 classic cocktails (rotating two to three times a season) along a Cartesian plane, from Refreshing to Spirituous and Comforting to Adventurous. A shining example of the range is the perennial favourite Death & Taxes, featuring locally-made Dorothy Parker gin and a marriage of juniper, hibiscus, elderberry and citrus notes, amplified by house-made grapefruit bitters and lavender-infused Cinzano Bianco.